Right now the grocery stores have $.99 strawberries and blueberries in my area. This is honestly the best news ever for a fruit snacker like me. As mentioned before, freezing fruit is always a great idea when it goes on mega sale. I stock up, fill freezer bags and have smoothies all winter long. When the freezer can’t hold anymore frozen berries, I make this and my husband kisses the ground I walk on. Okay not really, but it is an amazing dessert. Look at how vibrant it is! And it’s super simple. Anyone can make this. It’s quick, semi healthy and impressive looking and tasting. I tried this recipe from Sunny Anderson over at the Food Network and only modified it a little. I love Sunny Anderson. 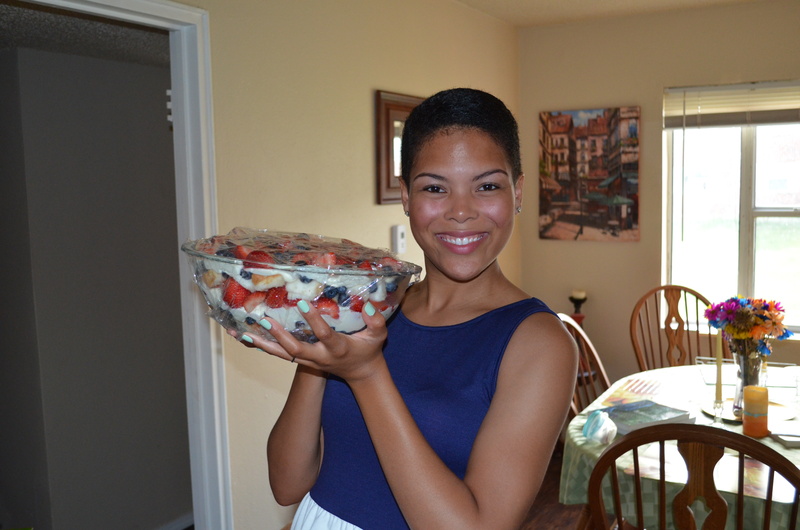 We share the same name (she spells hers incorrectly*) and her recipes are usually always a hit in my kitchen. I only had to modify because the hubby hates almond extract (he doesn’t even like a good strong amaretto sour) so I switched it out with a little banana and vanilla extract. It was amazing with these substitutions but I am sure the original is just as great. I hope you get a chance to make this soon! *I was of course joking about her name being spelled incorrectly. This Sonni loves all the Sunnys in the world. Heat 1/4 cup sugar, the lemon juice and 1/4 cup water in a saucepan over medium-high heat, stirring, until the sugar dissolves. Remove from the heat and stir in the banana and vanilla extract. Beat the remaining sugar and the cream cheese with a mixer on medium speed until smooth and light. Add the cream and beat on medium-high speed until smooth and the consistency of whipped cream. Arrange half of the cake cubes in the bottom of a large bowl. Sprinkle evenly with a layer of blueberries. Dollop half of the cream mixture over the blueberries and gently spread. 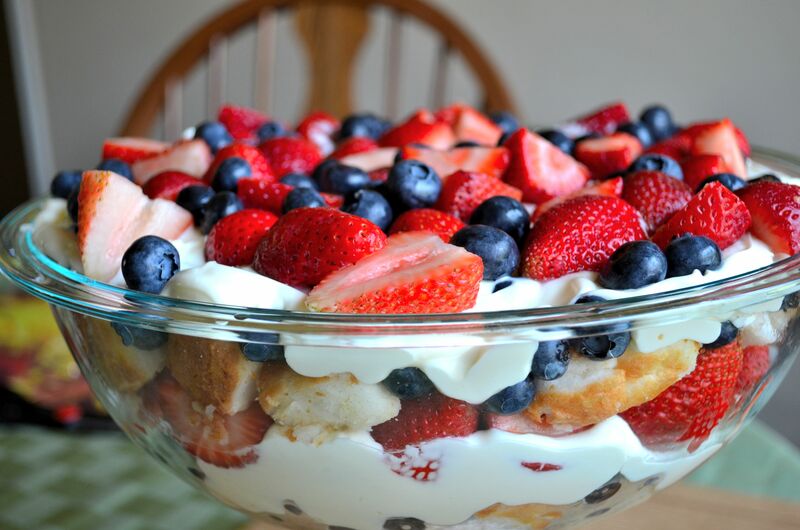 Top with a layer of strawberries. Layer the remaining cake cubes on top of the strawberries, then sprinkle with more blueberries and top with the remaining cream mixture. 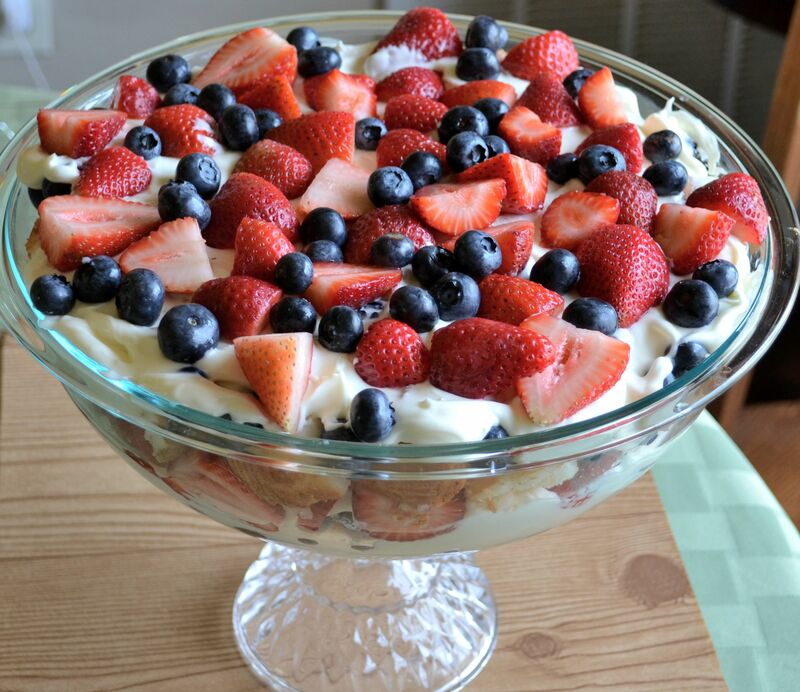 Finish with the remaining strawberries and blueberries, arranging them in a decorative pattern. Cover and refrigerate for at least an hour.